a term used by baseball scouts to describe a player who has a well-rounded offensive and defensive game; can hit for a high average, for power, runs the bases well, throws well and fields well. 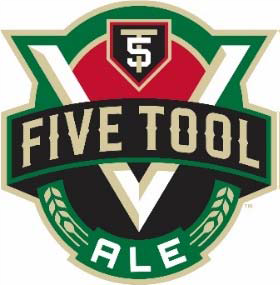 Like the rare and valuable five-tool player, Five Tool ale has what it takes to turn heads. An American cream ale – Five Tool is classic Midwestern Americana. The recipe features 6-row American barley and flaked maize, which adds a pleasant sweetness and texture. The result is an amazingly drinkable beer, sure to be a top pick at the taps. Five Tool made its debut in May 2017 and is available seasonally at select Northwoods League ballparks and surrounding communities. Baseball....Beer....Business....Family. Learn more about how these all came together in the form of a smooth, American cream ale. It's important to surround yourself with great teammates. Learn more about our partnership with the Northwoods League. Check out where you can find Five Tool on tap, our distributors, or contact us for information on becoming a retailer for Five Tool ale.